The annual Eagles Cancer Telethon on KTTC is must-see TV for many people in southeastern Minnesota — including the parents of Gina Razidlo, Ph.D., a cancer researcher at Mayo Clinic. 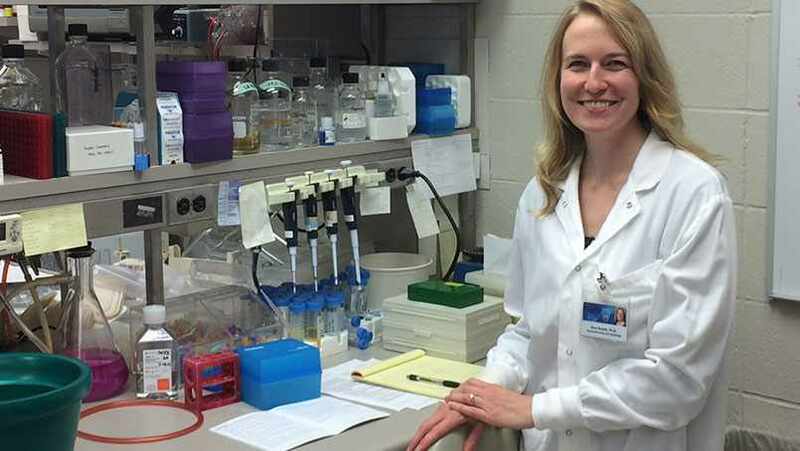 Dr. Razidlo grew up in Austin, Minnesota, where her community-minded parents “watched the telethon every year.” And while they always enjoyed seeing performances by talented locals, they now have another reason to tune in: Last year, their daughter’s research received telethon funding. Dr. Razidlo shared her gratitude as the keynote speaker during the 5th District Eagles Cancer Telethon Recognition Dinner, where she also provided an overview of her research. According to KTTC, Dr. Razidlo and her team are “working to find a way to block the spread” of tumor cells. “If you could block the spread, we’d have a much better chance of treating the cancer,” she told the audience. Her team is “honing in on a protein known as Vav1” that is present in many pancreatic cancers and causes “increased tumor-cell invasion,” and looking for ways to stop Vav1. They’ve had success with a drug called Azathioprine, which Dr. Razidlo told the audience “blocked 90 percent of the metastasis in mice with pancreatic cancer.” She calls that a “really exciting” finding, and one that her group is trying to build on. “We are trying now to figure out what will come next, how to treat people,” she says. Robert Diasio, M.D., director of the Mayo Clinic Cancer Center, told the audience it's “incredibly difficult to get cancer research money for young researchers,” so funding from the Eagles Cancer Telethon has a “huge impact” at Mayo Clinic. This year, 10 researchers received awards. Over the years, the telethon has provided more than $12 million to Mayo Clinic researchers. Funds raised through the telethon also support researchers at the Hormel Institute for Cancer Research and Masonic Cancer Center at the University of Minnesota. Dr. Razidlo says the telethon is a “real partnership” among scientists and the donors who support them. “It is an incredible honor to be supported by our community, and to know that the donations are given with a strong sense of hope that together, we can make a difference,” she tells us. It’s a difference she’s making as a scientist, and as a telethon supporter. In addition to being a telethon grant recipient, she’s also a donor. Support us by adding your comments below. Then, use the handy social media tools atop this page to share this story with others.